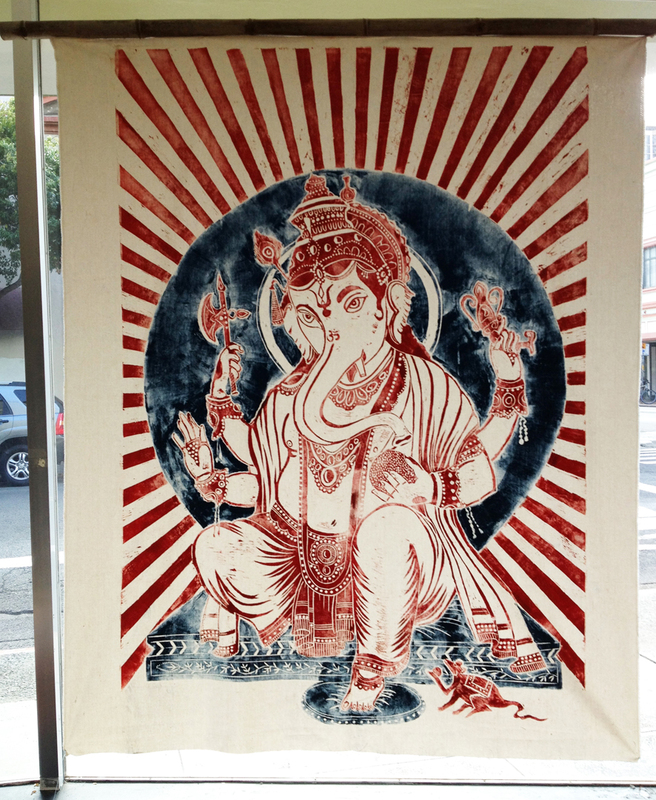 The timing for this large Ganesh was inspired by the beginning of the New Year and the event of ‘Print Bigger’ in Honolulu’s Chinatown on the First Friday in March 2013. As one of my intentions for the New Year I set out to do more collaborations and I invited Mike Nice, who I knew as a fellow printmaker and yoga practitioner. We carved and printed mostly together while occasionally working alone. It probably took about a month to carve the plate. We made three prints together using small rollers and brushes to apply different colored inks to bring out the different details. This process is extremely slow, taking at least four hours to ink up the plate and several hours to rub the sub straight to ensure enough saturation. Ganesh is widely revered as the Remover of Obstaclesand more generally as Lord of Beginnings and Lord of Obstacles,patron of arts and sciences, and the deva of intellect and wisdom,the god of transitions and the lord of letters and learning. He personifies the primal sound AUM. It is said that Ganesh resides in the first chakra and thereby holds and supports all the other chakras. 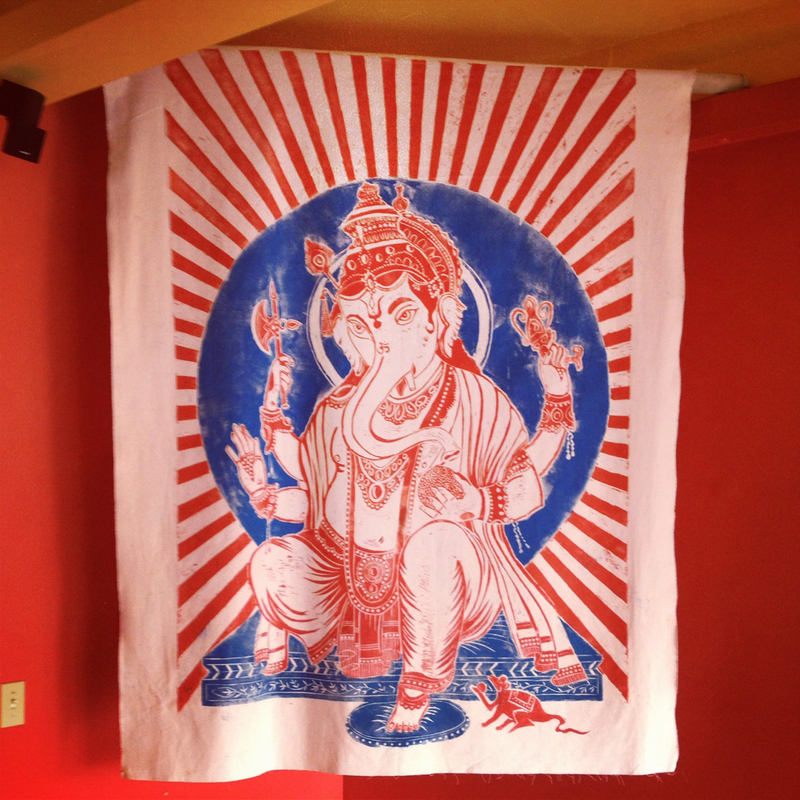 Devotion to Ganesh extends beyond India and Hinduism to Jains and Buddhists. His origins go back all the way to the pre Hindu Vedas (source Wikipeda). 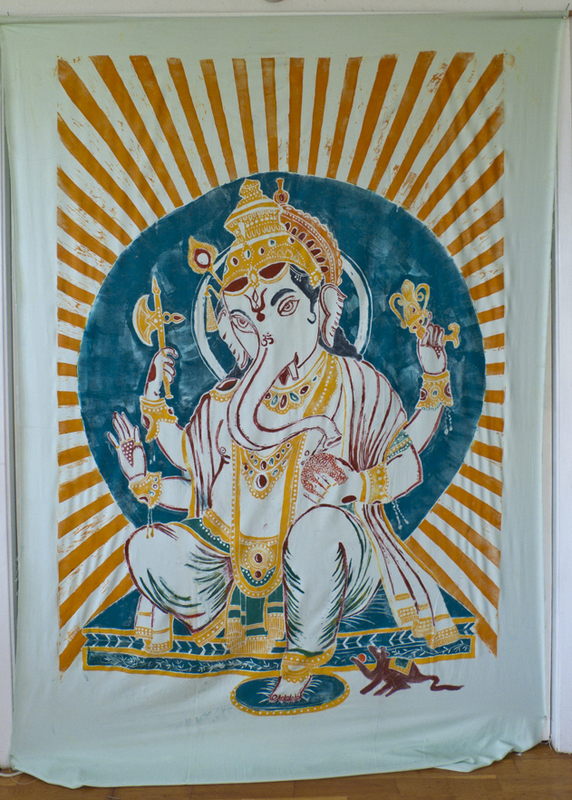 These large woodblock prints of Ganesh are part of the ancient tradition in art of combining spiritual practice with creating art that presents or is part of this practice. My first extensive exploration of this tradition was my ‘100 Views of Taiji”, 2003, 100 oil paintings of the taiji form inspired by my master’s Grandfather, and continued with the “14 Stations of the Cross” for the Church of the Epiphany in Honolulu. The sun prints also fit into this practice. 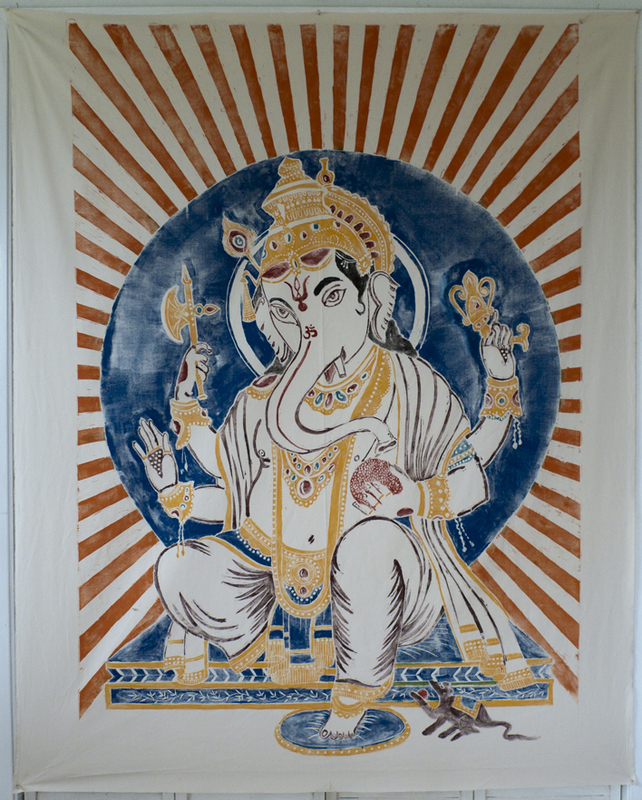 After several prints and paintings inspired by meditation and yoga, Ganesh is the most recent project in what I like to call, art as spiritual practice or inspirational art. The first describing the process and the latter pointing to the potential viewer.